Chef Koyama took on two new challenges in 2014. The first was to blend the two skills of chocolatier and “cacaotier.” This meant going beyond the usual role of a chocolatier (making chocolate from existing couvertures) and tackling the entire process from scratch: cultivating, fermenting, drying, and roasting the cacao himself. He has just embarked on this creative endeavor, in which he will use his skills as a cacaotier to open up new worlds of chocolate expression through original couvertures. 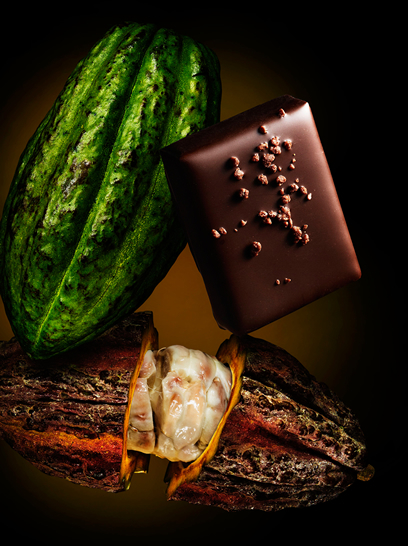 The second challenge is to earn five bars, the equivalent of five stars, for the fourth consecutive year at Le Salon du Chocolat held in Paris at the end of October. Chef Koyama has also set his sights on reclaiming the Most Outstanding Foreign Chocolatier award, which he missed out on in 2013. Looking back on this experience, he says, “I felt a sense of dissociation, as if the world had gone into slow motion in my immediate vicinity.” This bitter sensation laid the groundwork for his redoubled efforts in 2014. This year, the guidelines for submissions to the C.C.C. 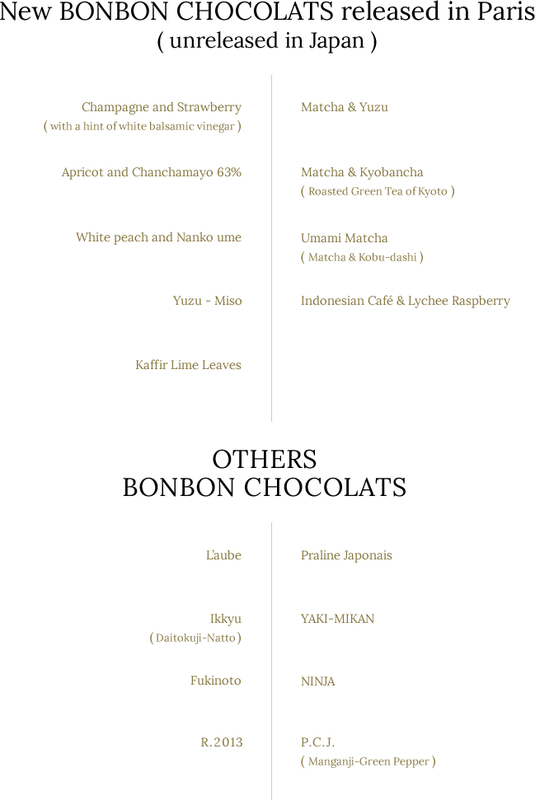 (Club des Croqueurs de Chocolat) Les Degustations competition have been changed, from five items in specific categories to four items freely selected by the chocolatier. This served as additional inspiration for Chef Koyama to heighten his creativity and originality even further, and create something unprecedented. The resulting theme for this season is Sense. Over the five decades of his life thus far, Chef Koyama’s keen receptivity has caused him to pick up all sorts of intriguing signals, and not only his five senses, but also the impalpable sixth sense has led him to ideas. Armed with these senses, he mixed together and percolated a wide range of emotions and themes gathered over a period of 11 months, and then gave them shape over a period of just one and a half months. The results are his submissions to this year’s Salon du Chocolat. With no further need to prove his consummate skill to the world, Chef Koyama invites you on a fresh voyage of discovery. The 2014 Collection: four creations that encapsulate Chef Koyama’s universe of emotion and inspiration, and offer them for the world to savor. After the cherry blossoms have passed their peak, they fall in blizzards of petals. Around this time our eyes are drawn to the vivid scarlet peeking out from the centers of blossoms and new buds, contrasting with the delicate pale pink of the petals. It evokes a beautiful yet ephemeral vision of a woman in a kimono, glimpsed from behind, a distinctively Japanese scene to which Chef Koyama adds dynamic inspiration. In fact, the source of cherries’ scent and taste is hidden not in their petals, but in their leaves, which contain a compound known as coumarin. The leaves of Someiyoshino cherry trees in Minami-Aso, Kumamoto Prefecture, are especially rich in coumarin, which resembles the zesty flavor of tonka beans. Chef Koyama extracted the flavor of cherry leaves by infusing it in fresh cream, then making a 40%-cacao chocolat au lait ganache. 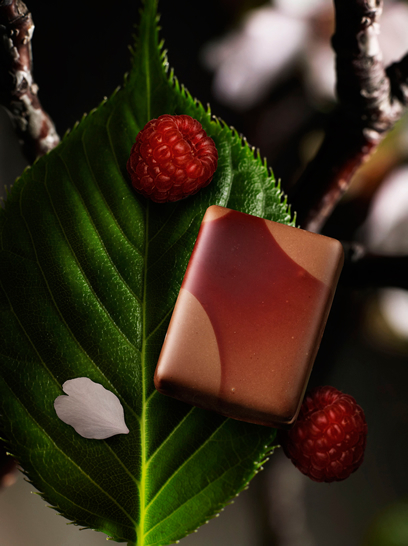 Underlying it is a lower layer of sweet-tart framboise (raspberry) ganache made with 64% Criollo beans from Madagascar. A totally new approach has led to a triumph of chocolat Japonais, in which an unprecedented collaboration between the singularly Japanese scent of cherry leaves and the opulent Western tang of framboise vividly embodies brief yet shining moments in our lives. At a Japanese teppanyaki grill, the final dish served is rice with garlic. This is flavored with shoyu soy sauce, which is poured onto the iron grill with a sizzling sound and gives off its most delectable scent when it is just about to burn. 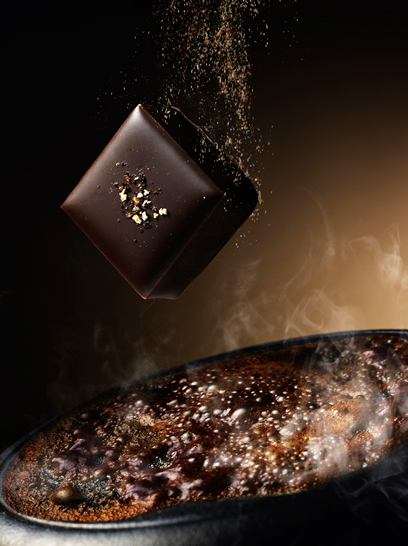 This is due to a mechanism called the Maillard reaction, in which the sugars in soy sauce react to heat and give off a fragrance, and Chef Koyama has applied this mechanism directly to chocolate. Heated soy sauce is blended with fresh cream just prior to caramelization, and the unique fragrance of soy sauce is sealed directly into 40%-cacao chocolat au lait. As an accent, a layer of powdered soy sauce, developed by the venerable Kyoto restaurant Shimogamo Saryo, is laid atop the ganache. This original powdered soy sauce, which the writer Kundo Koyama introduced to Chef Koyama, features hints of yuzu citrus peel and spicy ichimi chili pepper. The chef first tried it as a topping for white-fleshed sashimi, and says it gave him a chocolate idea right away. Afterward he experimented with a wide range of approaches before arriving at the flavor he wanted with two separate layers, of charred soy sauce ganache and powdered soy sauce. The fortuitous marriage of soy sauce’s “umami” flavor and the sweetness of chocolat au lait melts mellowly in the mouth, and follows the initial tang of soy sauce with a time-delay effect. The joy of this collaboration is just like that of a delicacy in Japanese cuisine. For Chef Koyama, the things that make food great are the three basic elements of bitterness, tartness, and sweetness, and the balance of the three. Here, the bitterness comes from three varieties of premium-quality matcha tea from Uji, Kyoto, ground finely in a stone pestle. 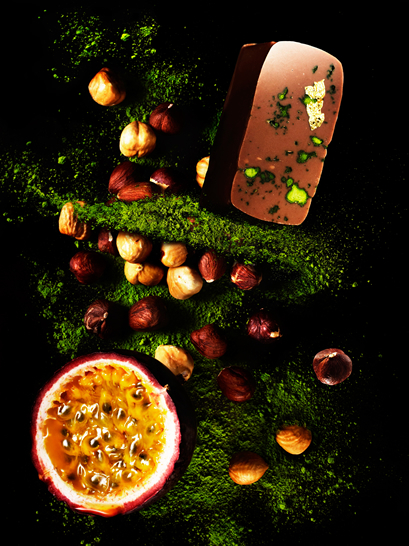 The tartness comes from the tropical zest of passion fruit. And the mellow sweetness comes from 38%-cacao chocolat au lait made with South African Criollo beans. What makes them come together so harmoniously in this Es Koyama praliné noisette is the mild yet rich and deep sweetness of hazelnuts. The water-soluble matcha ganache melts at once inside the mouth, then the oil-soluble hazelnut praliné gives way with a crispy crunch some time afterward. It is like a microcosmos inside the mouth, where flavors intertwine in a complex and expanding font of abundance. One piece brings the sort of satisfaction you expect from a multi-course meal. The seemingly avant-garde juxtaposition of matcha tea and passion fruit, as well, has a powerful impact precisely because of the splash these two strongly distinctive flavors make when they come together in harmony. This original creation encapsulates the traditions and refined sensibilities of Japanese cuisine, which a Japanese chocolatier is ideally situated to present to the world.